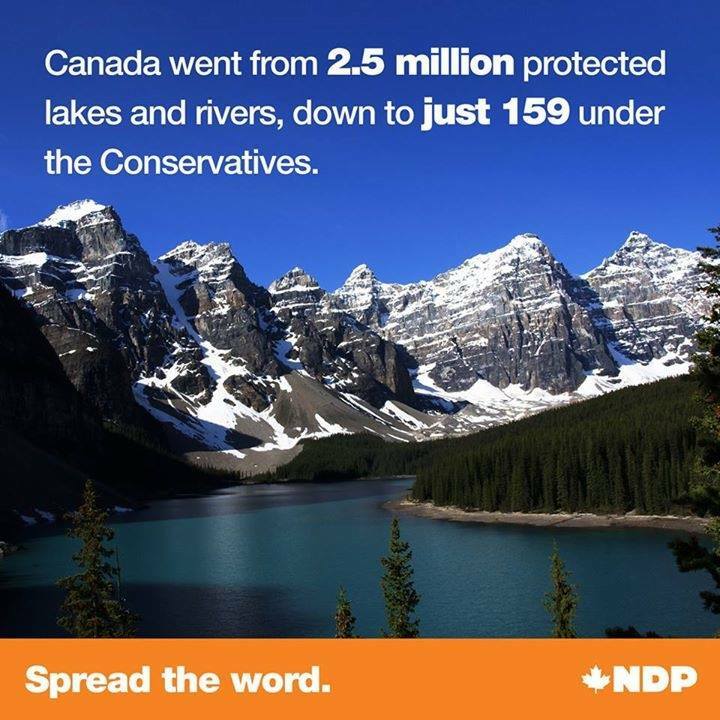 Canada went from 2.5 million protected lakes and rivers, down to just 159 under the Conservatives. Navigable Waters Protection Act, gutted. Fisheries Act, stripped. Environmental Assessment Act, repealed. Meanwhile mining applications are being fast-tracked and 10 billion litres of mine tailings are leaking into BC waterways. Is this claim correct? Is there any reasonable interpretation of the legislative changes made by the Canadian Conservative government, through which these numbers are accurate? The figures are correct. However, the definition of "protected" in the claim is very specific. The Harper Government decided to remove protection of navigation for all bodies of water in Canada. These bodies were formerly protected by the 1882 Navigable Water Protection Act. The original Navigable Waters Protection Act protected the lakes from any construction that might interfered with navigation of any body of water in Canada. This included dams, bridges and other blockages to transportation popping up without the government’s approval. Now, such government approval is not needed. Note: These protections of navigation differ from the protections against environmental impact. The new industry-friendly Navigable Protection Act was launched in 2012 and eliminated these protections for the vast majority of water bodies in Canada. The government presented and explained the new 2012 Jobs and Growth Act in this 457 page PDF document, showing 97 lakes, 62 rivers and 3 oceans that will be protected. This excerpt below includes a sample of the protected lakes/rivers (out of the 97+62 total). FROM AN ENVIRONMENTAL PERSPECTIVE, OUR WATERS WILL CONTINUE TO BE PROTECTED THROUGH THE CANADIAN ENVIRONMENTAL ASSESSMENT ACT 2012, THE CANADIAN ENVIRONMENTAL PROTECTION ACT, THE SPECIES AT RISK ACT, AND THE FISHERIES ACT. By comparison, Canada is estimated to contain nearly 32,000 major lakes and more than 2.25 million rivers: The NPA would exclude 99.7 per cent of Canada’s lakes and more than 99.9 per cent of Canada’s rivers from federal oversight. 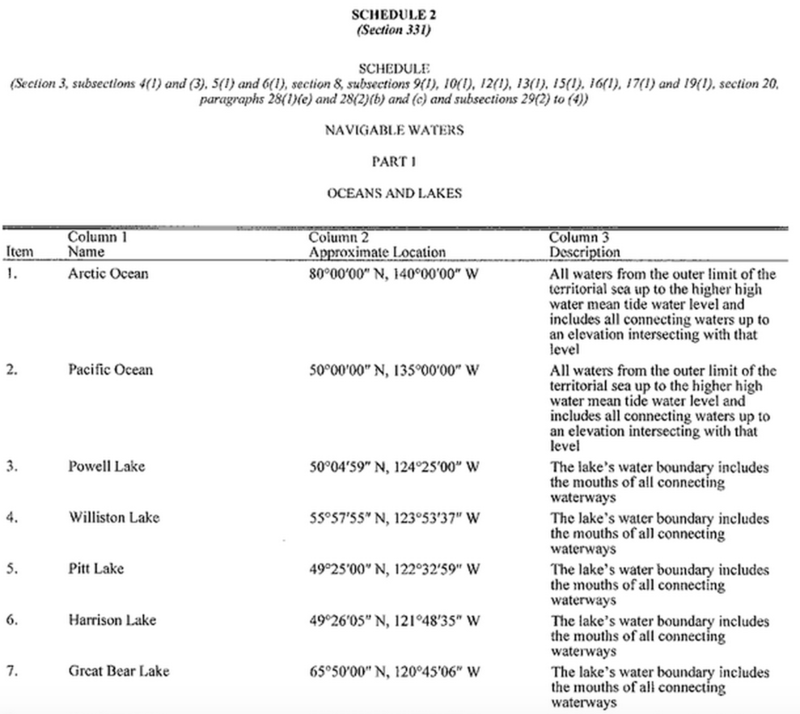 Notably absent from the proposed schedule are significant rivers in British Columbia, such as the Kitimat and Upper Fraser Rivers, which lie along the path of the proposed Northern Gateway pipeline. It means the removal of almost every lake and river we know from the Navigable Waters Protection Act. From one day to the next we went from 2.5 million protected lakes and rivers in Canada to 159 lakes and rivers protected. The Skeena is one of the few that was saved but none of its tributaries. You name the river, you name the lake and it is no longer protected by this act, and this has nothing to do with the budget that the government rammed through, it has everything to do with pipelines, because you are able to now are able to ruin navigation and not trigger an environmental assessment. You might be skeptical about the large number of lakes of Canada. The number of lakes is estimated at close to 31,752 by the Atlas of Canada, with 561 lakes with a surface area larger than 100 km2. As for the number of rivers, there are plenty that they couldn't fit into one Wikipedia page, so they were split by province. In 1948, Alexander De Buford attempted to travel as many Canadian waterways as possible. He travelled 250,000 rivers and thousands of lakes. After Buford's death the count of rivers in Canada is still unknown but is now estimated to be over 2.25 million. All the lakes and rivers will be protected by those acts: the Canadian Environmental Protection Act, the Species at Risk Act, and the Fisheries Act but not by 1882 old Navigable Water Protection Act which required approval for any works that may affect navigation on navigable waters in Canada (with the exception of 159 lakes/rivers and 3 oceans). Not the answer you're looking for? Browse other questions tagged politics environment canada .